The findings of a study reinforce the need to carry out risk assessments on the collapse of reef ecosystems. The corals of the Great Barrier Reef of Australia experienced a catastrophic extinction after the widespread wave of marine heat of 2016, which altered its ecological system, according to a study published in Nature. The research carried out by a team from the University of Cook, in Australia, indicates that the damage transformed the ecological functioning of a third of the 3,863 reefs that make up the largest coral system in the world. The findings of this study reinforce the need to conduct risk assessments on the collapse of reef ecosystems. The research team considered that it is necessary to undertake these evaluations if the measures taken on climate change fail, when it comes to limiting global warming between 1.5 and 2 degrees Celsius above pre-industrial levels. Expert Terry Hughes, the study leader and a group of colleagues located on a map the geographical pattern of heat exposure and resulting coral death along some 2,300 km in length. According to the findings, although many died immediately as a result of the temperature, others did so more slowly after the decrease of their "zooxanthellae", as the symbiotic yellowish-brown algae that live inside most coral reefs. The experts saw that coral death was largely related to the amount of discoloration and the level of exposure to heat, with the northern third of the Great Barrier Reef mostly affected. The death of coral also led to radical changes in the composition and some functional characteristics of coral assemblages in hundreds of individual reefs and some diverse and mature assemblages were transformed into other more degraded systems. The authors cautioned that full recovery in assemblages is unlikely, because many coral colonies continue to die slowly and because the replacement of dead corals will take at least a decade even for species that grow more quickly. According to the study, the Great Barrier experienced severe discoloration again in 2017, which caused more damage. The experts considered that coral reefs across the tropics will probably continue to degrade until the climate change process stabilizes. 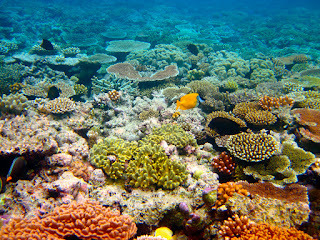 This will allow the remaining populations to reorganize into assemblages of temperature-tolerant reefs, they concluded.